IIS integration has been completely reworked. Profiling can be explicitly enabled and disabled, it can be also active when the profiler is not running and between web applications restarts. Remote and local applications are displayed together in the "Monitor Applications" list on Welcome screen. You can monitor CPU usage of remote applications in real time. 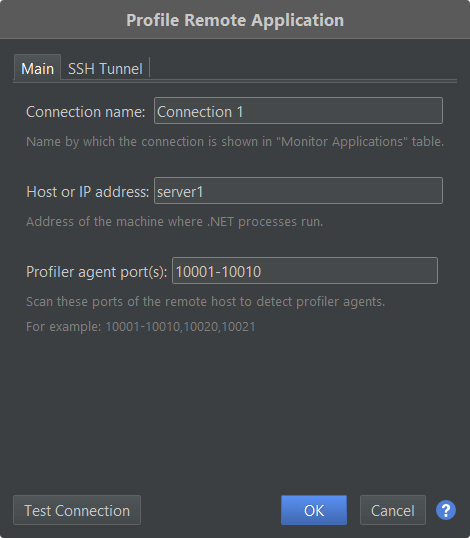 Dialog for connecting to remote applications has been improved. 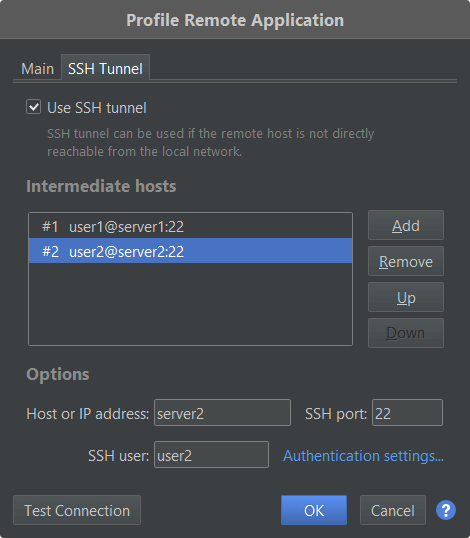 The remote connection dialog allows to set up an SSH multi-hop tunnel through any number of intermediate machines. New toolbar button allows to transfer snapshots from the remote machine missing on your local machine. 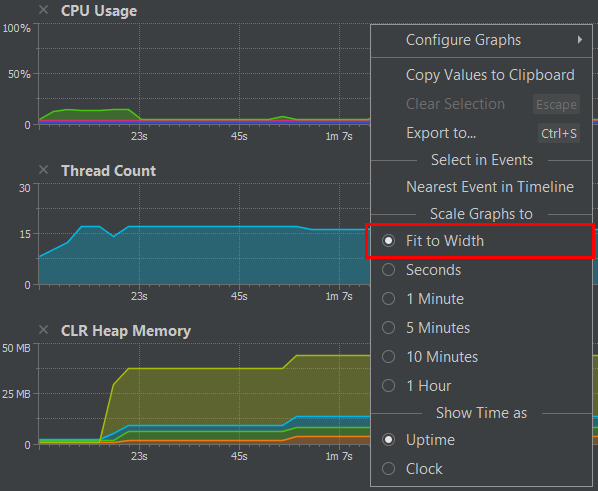 Threads view now shows per-thread CPU usage graphs. Thread header elements in Threads view are vertically aligned to improve usability. 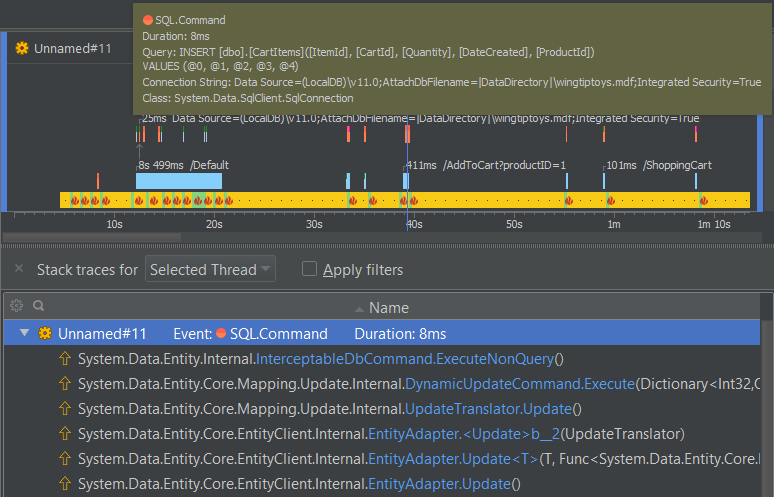 You can click on particular event in Threads view to see its stack trace. Threads view now allows to change scale. New "Fit to Width" scaling option has been added in Threads view. Searchable stacks are in all telemetry views. Welcome screen has been refined and reworked. Single action for capturing snapshots was split in two separate actions: "Capture performance snapshot" and "Capture memory snapshot". Horizontal scrolling is now possible with mouse wheel and two fingers gesture in telemetry graphs and tables. Auto-scrolling in tables and in Threads view has been reworked to improve user experience in live profiling sessions. Stack trace presentation has been improved in all views, e.g. quick info. It is now possible to hide hints. Better filtering of development tools in the "Monitor Applications" section. Visual Studio 2017 is supported. If the user allows, the profiler now may collect anonymous UI usage statistics to help YourKit improve user experience in future versions. Startup option port was extended to allow a specification of a port range too. The syntax is port=<min_port>-<max_port>.